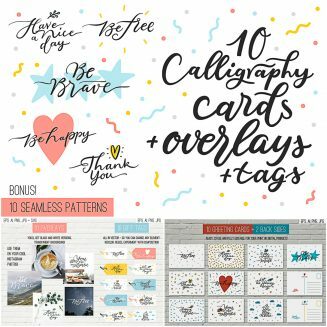 This products is a set of 10 ready-to-use vector quotes, 10 greeting cards, 10 gift tags and 10 patterns as a bonus. It’s a handwritten calligraphy without using fonts – every letter is unique! Perfect for greeting cards, apparel, poster, mugs, bags, packaging, and much more! File format: .ai, eps, .png, .jpg for Photoshop, Illustrator or other software. Tags: brave, brush, calligraohy, clipart, gift, greeting card, ornament, overlay, print, silhouette, thank you.